Nestled in the lush, tropical foliage that surrounds Paradise Point Resort & Spa in San Diego is a portal to a place where exotic rituals of gentle Eastern cultures and indigenous San Diego influences collide. SpaTerre offers custom-designed Indonesian and Thai spa rituals that incorporate a blend of ancient traditions. The Cranberry Fig Body Polish uncovers smooth, glowing skin with a gentle exfoliation followed by rich body butter that is gently massaged into the skin, locking in moisture. Step 1: After welcoming the client, asking her to fill out the proper intake forms and making sure she is not in any stage of pregnancy, ask the client to disrobe and lay face up on a wet treatment table in a wet room equipped with a Vichy shower. The treatment table should have bath sheets and plastic covering a dry towel. Bath mats should be placed around the table to ensure safety. Step 2: After explaining what to expect in the treatment, begin gently exfoliating the body with a cranberry fig sugar exfoliant. 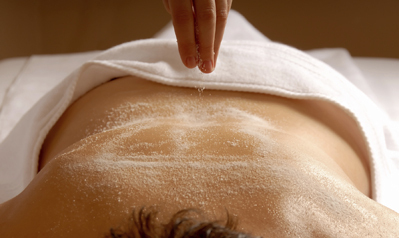 Ask the client to sit while you exfoliate the back, then lay back down. Exfoliate the front, bending legs to access entire leg and bending arms to access entire arm, as well. This step cleanses and moisturizes skin, leaving it smooth and silky with a lasting aroma. This portion of the treatment should last 20 minutes. Step 3: After completing the application of the sugar exfoliant, start the Vichy shower, making sure the temperature is comfortable for the client. Provide a towel in order to cover the client’s face from splashes. Step 4: Administer the Vichy shower to the front of the body for two minutes. Adjust shower heads to help remove the scrub. Step 5: Ask the client to turn onto her back, assisting if necessary. Ask the client to hold her drapes and inform her that you will catch the drape in the back. Also, caution the client to move slowly and do not slide off the table. Step 6: After covering the face with a new dry towel, Vichy the back of the client’s body for five minutes. Complete the Vichy, remove face cloth and pat the client dry. Step 7: Slide plastic out from under the client leaving her on the towel underneath. Step 8: Begin the prone massage using the vanilla body lotion. Turn the client and continue massage to the front of the body. The massage should last for 20 minutes. Conclude service.